Bob Feller once said – “Every day is a new opportunity. You can build on yesterday’s success or put its failures behind and start over again. That’s the way life is, with a new game every day”. Sports inculcate within us team spirit, a sense of unity, togetherness and oneness. In a vast nation like India, sports have been a unique binding force – transcending barriers of region, religion, caste, class and gender. In a beautiful irony, the personality and character of Franz Gastler, an American, drive home this unique facet of Indian sports very forcefully. Gastler, a social activist, teacher and football coach is the co-founder and executive director of the non-governmental organisation – Yuwa. When translated, the term “Yuwa” means “youth”. Gastler arrived in India in 2008, at the age of 29, and took up a job at Krishi Gram Vikas Kendra – a non-governmental organisation which aids the economic development of Jharkhand. Gastler has a bachelors and a masters degree in international political economy. He also pursued a certificate course in negotiation and mediation at Harvard Law School. He is the epitome of a truly 'educated' person - a literate person merely possesses the ability to read and write, but an educated person widens his horizons, knows how and what to think and understands that it his responsibility to give back to the society. A girl once asked Gastler whether he could teach her to play football, he agreed and encouraged her to search for more team-mates, for he thought that team-work could help ensure gender equality, confidence and self-respect. The choice of football as sport is interesting – since it is a team sport, it provided for a “powerful platform to bring girls out of isolation and into a positive team environment”, says Gastler. It “gives girls an outlet and forum for self-expression and self-improvement, a place where a girl realizes her self-worth and her power to break the cycle of poverty”, he adds. 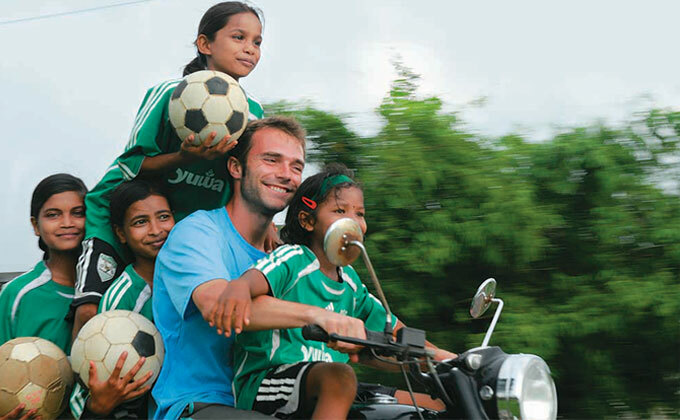 The NGO combats child marriage through football and education. Poverty breeds poverty, illiteracy and dependence. Yuwa aims to release the girls of Jharkhand from this vicious cycle. And the results are commendable – in a recent report, it was found that no girl belonging to Yuwa was forced into child marriage. Also, since the teams are self-initiated, peer-led and designed to encourage financial saving and planning, it helps the girls to imbibe within themselves the core skill set needed for employment. Eventually, the girls either become sports coaches at Yuwa or move on to play at the state, national and international levels. Besides football, Yuwaorganises work-shops which discuss issues such as health and personal hygiene, gender, domestic violence, gender-based violence, self-esteem, financial management and work ethics. These hands-on workshops encourage the girls to interact with each other in a healthy environment, which fosters mutual understanding, growth and a very holistic personality development. It is often said that when you educate a man, you educate only a single person but when you educate a woman, you educate an entire family, a society and eventually, a nation. An educated female will understand the importance of attaining and imparting literacy to her children, which in turn will ensure a bright future for the nation as a whole. Kofi Annan believed that the education of girls is the single highest returning social investment in the world today. Thus, this initiative by Gastler, a foreigner, is truly an awe-inspiring endeavour, which motivates one to do one’s duty as a citizen of India, to give back to the society more than what one has received from it.